Later they moved to the newly built High Glenan in Queen Street, had a brief stay at Barremman Farm, Clynder, and finally took over and modernised the Old Schoolhouse close to the Black Bridge in Glen Fruin — a place he loved. He was a prolific artist who tried many different styles throughout his career, from the traditional to murals of overlarge circus ladies on the walls of the Garth Inn. For a Larchfield (now Lomond) School play he painted a backcloth with a huge bus, emblazoned with an advertisement: 'Larchfield Lotion for Lumbago'. He was noted for his cartoons of Helensburgh town councillors and leading businessmen, but also wrote childrens books and was a periodic broadcaster for the BBC. Hundreds of Hermitage Academy pupils and others in Bearsden learnt about art from him, and he ran many evening classes at which some of today's local amateur artists had their work developed and improved. 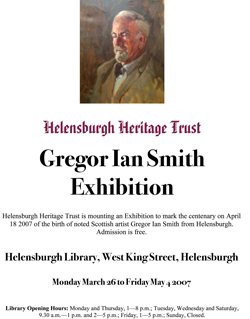 Gregor Ian was president of Helensburgh and District Art Club for many years, and, as a long time friend of Nance Anderson, he served as a trustee of the Anderson Trust which she set up and which owns many pictures of local importance, including some of his works. The current trustees offered to help the Heritage Trust in setting up the exhibition, an offer which we gratefully accepted. After months of preparation the exhibition was held in the Library during the month of April and the first week of May, and was very well attended. It had over 70 paintings, a number of cartoons and caricatures, old photographs, a selection of the books Gregor Ian wrote, and other memorabilia. It was opened by Councillor Billy Petrie, convener of Argyll and Bute Council, in the presence of Charlie and Campbell Smith, two of the artist's four sons, and his daughter, Mrs Kirsteen Scott. Opening Ceremony photo by Donald Fullarton.